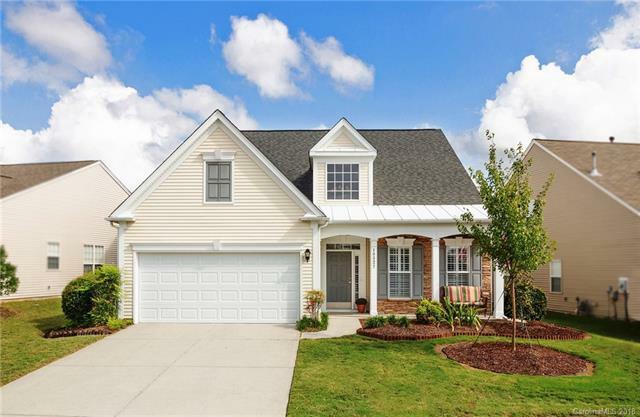 Beautiful Auburn Place home features upscale lighting, new SS appliances, updated laminate flooring, freshly painted interiors in many rooms, furnace (2015), architectural shingle roof (2012), custom drapes, and much more. Kitchen features granite Ctops and "cocoa-glazed" maple cabinetry. Floor plan is open and airy. Main level master bedroom with tray ceiling, second bedroom down with full bath. Third large bedroom upstairs has full ensuite bath and enjoys access to a spacious loft area overlooking the two-story great room. Enjoy the backyard oasis from the screened porch, custom enclosed patio or fenced yard featuring mature plantings. Unbeatable location across the street from Blakeney shopping center. Also close by are medical facilities and great lifestyle amenities at Waverly, Stonecrest, and Ballantyne. One-Year home warranty offers peace of mind. Sold by The W Realty Group Inc..